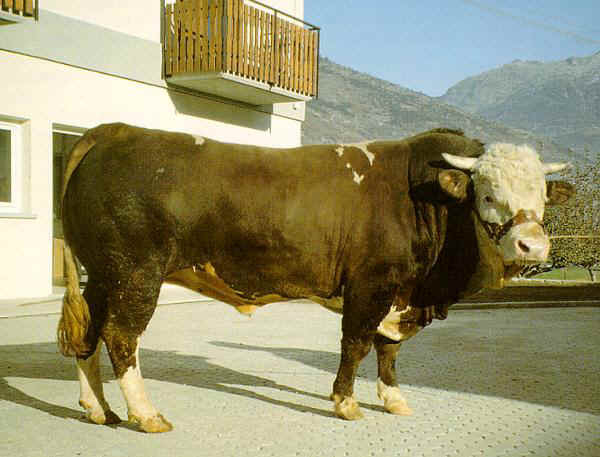 This is the autochthonous breed from Valle d’Aosta, where almost all heads are bred (85%). It is either for milk or meat, with a fairly good milk production considering the size of the animals (on average 500 kg alive), their frugality as well as their quite good meat production and good butchery yield. 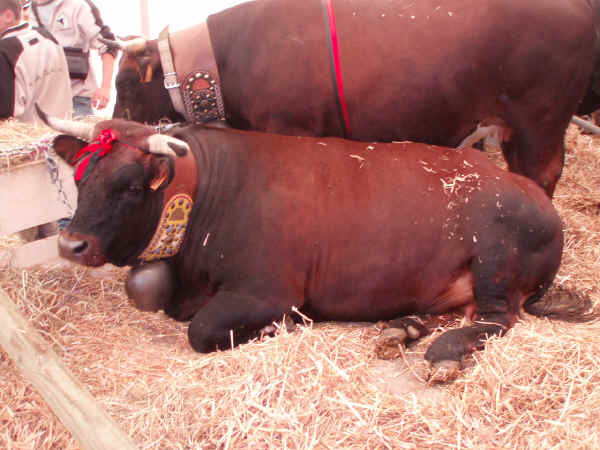 It is the most common breed in Val d’Aosta (in 2003 there were 13,241 heads registered). It is marked by a red Pied coat shading from a light to a dark red with white head, abdomen, parts of limbs and tail. 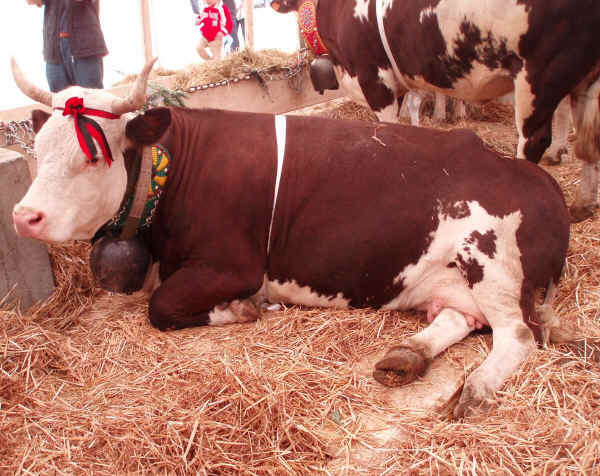 Like all red pied breeds grazing in the Mount Blanc valleys, this one comes from red pied cattle dating back to the end of the fifth century (Burgundi). 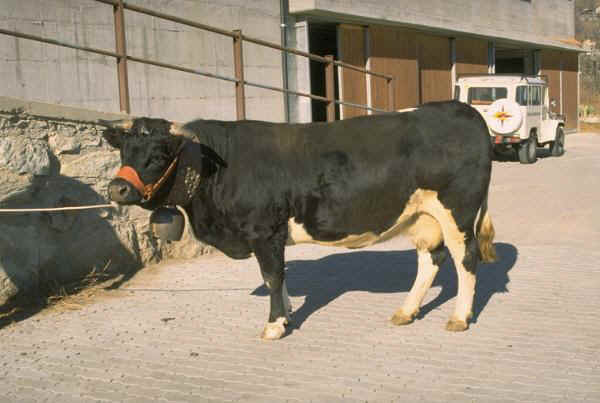 One of the typical Italian dairy breed which is appreciated for its quality meat and its strength. Particularly docile and strong, it is very apt to harsh climate and also resistant to ordinary pathologies. Long-lived, frugal, this breed is able to live on coarse forage. Valdostana Pezzata Nera and Castana together with the Swiss Hérens belong to the authochtonous cattle which originated in the Alps, coming probably from ‘Bos brachyceros’. Brachycephalic breeds stand out for their lively temperament, their rusticity. They both belong to the same Genealogical Book, but being different in the coat. Milk production is lower than in the Valdostana Pezzata Rossa. The coat of Pezzata Nera has a black and white pigment to built up the typical pied, while Castana has a uniform black and red pigment shading from black to tawny. In 2003 there were 7,094 heads registered. It has similar features as Pezzata Rossa, but it is usually less developed, more rustic, stronger and more harmonious. These animals show a lively quite aggressive temperament when grazing: they establish a sort of hierarchy within the herd by fighting uncruelly, though. 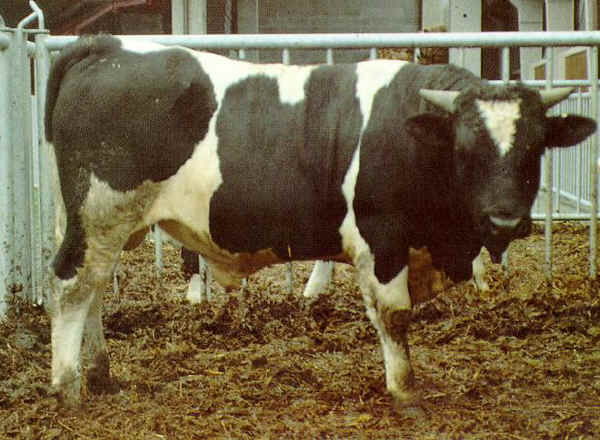 It is just by exploiting this peculiarity that since over 50 years breeders organize fightings between their heifers ( Batailles de Reines) in order to point to the strongest and give it the title of Reìna (queen).